With just a few minutes you can make your own real-time iPhone photo filters. Who needs Instagram? Well, me for one, ever since I gave up on Flickr and never really got started with the evil Facebook. But I’m pretty bored with the Instagram filters already (they could toss them all except X-Pro II and I wouldn’t even notice). And yes, there are a million other photo-filtering apps out there, but what about a little DIY? 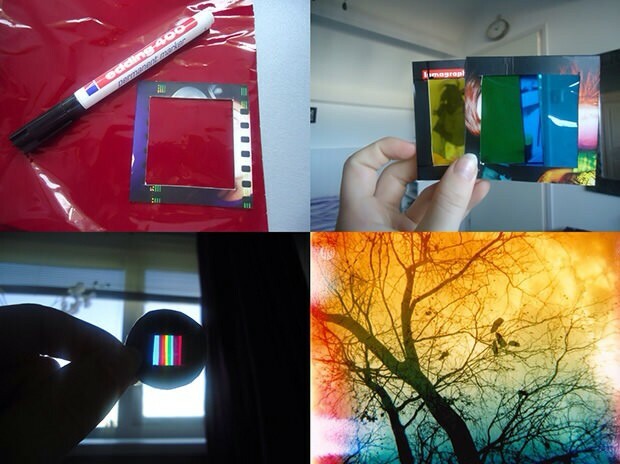 If you’re feeling adventurous, grab some tape, some colored gels and your iPhone and head over to Lomography for this great little low-tech project. The idea is simple. You take a rainbow of colored gels (from the craft store is best, and probably cheaper than a pro-photo store), cut them into strips and glue them (using colorless glue) into a black card frame. You then just stick the newly-hued filter in front of your iPhone (or other camera) lens and shoot. Instant, real-time effects are added to your pictures. To vary the sharpness of the effect, move the square closer to (more blurred) and farther away from (sharper edges) the lens. If the iPhone tries to focus on the filter instead of the subject, use an app which has a focus lock to compose the image before slotting the filter into place. If you’re using a camera with interchangeable lenses, you can put a tiny little filter behind the rear element of the lens itself, completely obliterating any sharp edges. This is only recommended with film, though, as things are likely to get dusty in there. I love this little hack. And you can of course overlay multiple filters to stack the effects, although every layer will soak up a little more light. Got a spare few hours this afternoon? Then off you go!